Americans love gas-guzzling crossover utility vehicles (CUV), and the trend isn't going away anytime soon. BMW's latest X5 xDrive40e hopes to quench the gasoline thirst by having owners plug in and charge every night with its first plug-in hybrid electric vehicle (PHEV). The X5 xDrive40e joins BMW's existing lineup that includes a turbocharged six-cylinder xDrive35i, the V8-packing xDrive50i and the diesel xDrive35d, which get 20, 17 or 26 mpg combined fuel economy ratings from the US Environmental Protection Agency (EPA), respectively. The diesel carries the highest fuel economy rating, but Volkswagen's emissions cheating scandal may turn buyers away from the heavy NOx-emitting oil burners. By adding an electric motor and battery pack, the X5 xDrive40e can drive without polluting for up to 14 miles and receives a 56 MPGe rating. It becomes a regular hybrid vehicle once the battery pack is depleted for a combined 24 mpg. I recently spent a week with the X5 xDrive40e, drove it around the track during NWAPA Mudfest 2016 and walked away impressed. The test vehicle was an xLine trim level with a few options, including premium package, backup camera, LED headlights and cold weather package that brought the MSRP to $72,000 (starting at £51,000 / AU$118,900). BMW downsizes the motor in the X5 xDrive40e to a smaller turbocharged 2.0-liter four cylinder, down from the base twin turbo 3.0-liter six cylinder or optional twin turbo 4.4-liter V8. The gasoline motor produces 240 horsepower (hp) with 260 pound-feet (lb.-ft.), which puts it at a 60 hp disadvantage from the base six cylinder. An 8-speed automatic is the only transmission available. 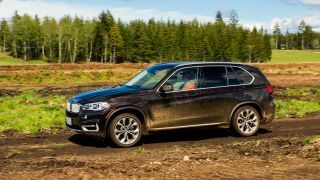 However, unlike a standard automatic transmission, the X5 xDrive40e replaces the torque converter (placed between the motor and transmission) with an electric motor. The electric motor makes 111 hp and an instant 184 lb.-ft. of torque. Total combined power output is 308 hp with 332 lb.-ft. of torque, which is a slight boost from the base six-cylinder, but still far from matching the 445 hp V8 or torquey diesel. A 9.2 kWh battery pack enables up to 14 miles of pure electric driving range, but takes 2 hours and 45 minutes to completely charge via 240-volt Level 2 charging station. As with EVs, the charger is inside the car and the charging station only serves as a power source. The X5's onboard charger only charges at 3.5 kW, which is much slower than the Nissan Leaf's 6.6 kW unit that juices up its 30 kWh battery in about 5 hours. Top speed is limited to 75 mph in pure electric mode, but it can reach a governed top speed of 130 mph with the gasoline motor. So what's it like to drive BMW's first PHEV? The powertrain is excellent and smoothly switches between the electric and gasoline motors with minimal vibration. You can hear the engine turn on and see the tachometer needle sweep to life, but it didn't violently shutter off like start/stop systems in pure gasoline vehicles. There is a noticeable delay when flooring the gas pedal from a complete stop, before the car starts moving. The delay was noticeable in the more responsive sport driving mode, too. Throttle response isn't an issue once the car is rolling, however. I found myself driving gentler, easing into the throttle to maximize EV range most of my time with the X5 anyways. The best range I was able to get out of pure EV mode was 12 miles, with climate control turned on and driving around town at speeds between 25 to 35 mph. I even tried out the eco pro drive mode, which reduces climate control usage and loosens the throttle response without any change to electric range. It's 2 miles short of BMW's official rating, but still below what you can get in a mid-size PHEV sedan like the 21-mile capable Ford Fusion Energi or 27-mile rated Hyundai Sonata PHEV.